For centuries, the harbour at Eyrarbakki was the main port in the south of the country, and Eyrarbakki was the trading centre for the whole of the southern region extending from Selvogur in the west to Lómagnúpur in the east. By about 1925, however, Eyrarbakki lost its importance as a trading centre. The latter part of the 19th century saw a great increase in the number of oared fishing boats. In fact, although trade and fishing were the main occupations in Eyrarbakki, the natural harbour conditions were not good, and after the bridging of the nearby River Ölfusá, the harbour fell into disuse. The oldest building in the village, Húsið ("The House"), is a Norwegian kit home dating from 1765 and is the oldest preserved timber dwelling house in Iceland. It now houses the Árnesinga Folk Museum. The church in Eyrarbakki was built in 1890; its altarpiece was painted by Queen Louise of Denmark, wife of King Christian IX, great-great-grandfather of Queen Margrethe II of Denmark, Elizabeth II of the United Kingdom and King Harald V of Norway. The most recent enterprises in Eyrarbakki have been a fish-processing plant, and an aluminum frying-pan plant. However, the main fish factory closed in the 1990s, and the frying-pan factory has closed as well. 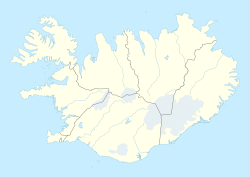 The nearby prison, Litla-Hraun, the largest in Iceland, is one of the town's main employers. In addition, there are a few small farms, with the traditional Icelandic horse breed. Tourism is another mainstay of the small economy. 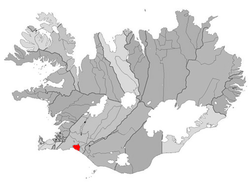 ^ "Iceland Meteorological Office: 30 years average 1961-1990 for Eyrarbakki, Iceland". Iceland Meteorological Office. Retrieved on April 6, 2013. Wikimedia Commons has media related to Eyrarbakki. This page was last edited on 29 May 2018, at 05:27 (UTC).